"We are exporter and majorly we deal in export inquiries". 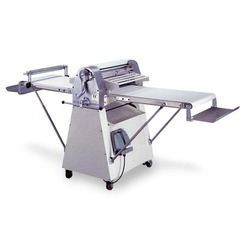 We offer a wide range of very high quality Dough Sheeters to our most trusted customers. These products are offered with full polished stainless steel food grade quality body construction. These products are offered with smooth surface is of aluminum which improves hygiene of the pastry roller. These products are provided with safety grids which comply with the standards in force. These products undergo various quality tests at each level of its production to ensure superior quality and flawless performances. Looking for Dough Sheeters ?